ACL tears and other orthopedic injuries are often attributed to playing sports on artificial surfaces. But does synthetic grass really put athletes at a greater risk of injury than natural grass? Over the past several years, many studies have analyzed this question, evaluating injury rates and types in an attempt to find a definitive answer. While natural grass can provide a safe, environmentally friendly and cost-effective playing surface that may help prevent some sports injuries, artificial turf is considered by many to be equally suitable for playing sports. But it is commonly believed that synthetic grass has more traction than natural grass and, therefore, leads to more injuries. Although this may well have been the case with the first and second generations of artificial turf, today’s surfaces are quite different than the original products, and much more comparable to natural turf. Recent advances in technology have led to synthetic turf that has a more natural look and feel, and it plays even more like real grass than ever before. The question now becomes: Is today’s generation of synthetic surfaces responsible for an increased risk of sports injuries? The answer remains unclear, as not all research studies have arrived at the same conclusion. Some research does indicate a higher incidence rate of orthopedic injuries on artificial turf. For example, one study published in The American Journal of Sports Medicine concluded that college football players suffer about 1.39 times as many ACL tears when not playing on a natural surface. Yet, according to other research, synthetic and natural surfaces lead to an equal number of orthopedic injuries. A study of professional soccer players by the University of Rome found no difference in the injury rates of athletes playing on natural grass and those playing on artificial turf. Yet another study published by the U.S. National Library of Medicine reviewed injury rates from other research and determined that third-generation synthetic grass is comparable in safety to natural grass. 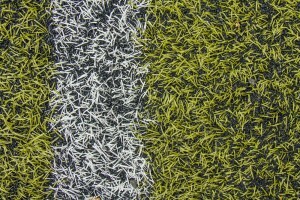 The most recent evolution of artificial turf has not been conclusively studied, as it has only been widely available for a short time. Who Is at Risk for Orthopedic Sports Injuries? Research reports may seem conflicting due to a number of other factors — including climate, footwear, sport and player position — that can affect an athlete’s risk of injury. Most research does show, however, that children, adolescents, women and middle-aged athletes are more vulnerable to suffering orthopedic injuries on any playing surface. Preventing injury may not always be possible, but to reduce risks, always use appropriate, properly fitting sports equipment, and receive training before playing any new sport. Be sure to warm up before activity and always observe and respect your body’s limits. Regardless of the sport surface involved, any injury requires medical treatment. Call the professionals at the Steward Health Care: Centers of Orthopedic & Sports Medicine in West Jordan, Utah. Our physicians are experienced at diagnosing and treating all types of sports and orthopedic injuries. This entry was posted in Sports Medicine, Foot & Ankle, Knee, News on January 19, 2016 by Mark Peterson, DO.